Denmark has a rich pre-history, with several cultures living here since the end of last Ice Age around 12,000 years ago. Denmark (Danish: Danmark) is the smallest of the Nordic countries. Denmark, the Faroe Islands and Greenland are collectively and formally known as The Danish Realm (Det Danske Rige). While all three have their own constituent parliaments, they are also part of The Kingdom of Denmark with Queen Margrethe II as symbolic monarch. The main part of Denmark proper is Jutland, a peninsula north of Germany, but Denmark also includes a great number of islands, of which the major ones are Zealand and Funen. Most of the islands are situated in the small shallow sea of Kattegat and the Baltic Sea, between Jutland and Sweden. Separated from the other islands, Bornholm lies by itself between Sweden and Poland in the Baltic Sea. The capital, Copenhagen, is located at the most eastern side of Zealand. Once the seat of Viking raiders and later a major north European naval power, The Kingdom of Denmark is the oldest kingdom in the world, still in existence, but has evolved into a democratic, parliamentary, modern and prosperous nation. The country is participating in the general political and economic integration of Europe. However, the country has opted out of the European Union's Maastricht Treaty, the European monetary union (EMU - the Eurozone), and issues concerning certain internal affairs. Denmark is the birthplace of one of the world's most popular toys, Lego, and boasts the Legoland theme park in Billund. These days, the Danish Vikings have parked their ships in the garage and put the helmets on the shelves, and along with the other Scandinavian nations, have forged a society that is often seen as a benchmark of civilisation; with progressive social policies, a commitment to free speech so strong it put the country at odds with much of the world during the 2006 cartoon crisis, a liberal social-welfare system and, according to The Economist, one of the most commercially competitive. Top it off with a rich, well-preserved cultural heritage, and the Danes' legendary sense of design and architecture, and you have one intriguing holiday destination. Dubbed in various surveys and polls throughout the years as the "happiest country in the world", it is often pictured as a romantic and safe place, likely linked to Hans Christian Andersen as a "fairy tale" on its own. Of course much more lies beneath the surface, but for the traveller, Denmark is likely to prove convenient, safe, clean, but also quite expensive to visit. Though not immediately obvious on a map, Denmark comprises more than 400 islands, of which 72 are populated. The peninsula of Jutland and the main islands make up most of the population and land area; smaller islands are here categorized as part of those. Denmark's largest island with the capital Copenhagen. Nearly 40% of the country's population live here, although it only accounts for 15% of the land area. The vacation island, also known as the "rock island", home of the fabled roundhouse churches and some excellent beaches. Local administration in Denmark is made up by five regions and 98 municipalities (kommuner). These subdivisions are of little concern to visitors. Greenland and the Faroe Islands are self-governing territories within the Kingdom of Denmark and are not covered in this article. 55.67611112.5683331 Copenhagen (København) – Denmark's capital and largest city with a population of 1.2 million in its metropolitan area and a vast number of offers for cultural experiences and interesting shopping inspired with Danish design traditions. 57.059.9166672 Aalborg – An old port town and industrial centre with a historic and picturesque city centre, including the rowdy street of Jomfru Ane Gade; featuring some of the most vibrant night life in the country. 56.157210.21073 Aarhus – the largest city on the Jutland peninsula and Denmark's second largest city, with a population of 320,000 in its metropolitan area. As an educational centre, Aarhus offers many cultural experiences and has a vibrant and diverse night life. Also being a centre of food production and conferences, Aarhus is among the best places in Denmark to eat. The brilliant Old Town open air museum with reconstructed old historic timber-framed buildings from all over Denmark, is one of the most popular attractions in the country. 55.4833338.454 Esbjerg – Denmark's hub for the fishing and offshore oil and gas industry, and a short 15-minute ferry ride away from the cosy island of Fanø. The large Wadden Sea National Park is close to Esbjerg. 55.39583310.3886116 Odense – the main city of the island of Funen, and Denmark's third largest city, known as the birthplace of fairytale writer Hans Christian Andersen. The old historic town centre features cosy winding cobbled streets with interesting streetscapes of both medieval listed buildings and modern architecture. The countryside is also of interest, including the open air museum The Funen Village. 55.6512.0833337 Roskilde – half an hour from Copenhagen is a picturesquely placed city, hosting a world heritage listed cathedral as well as a great Viking ship museum. 57.71666710.5833338 Skagen – the most northern point of the mainland, this sleepy fishing town bursts into life during summer. It is the place to watch as two oceans meet at the "tip of Denmark", bike around the scenic surroundings and dine on excellent seafood. It is among the most popular summer destinations in the country, including that of the Copenhagen rich and famous. 54.913829.792259 Sønderborg – discover Danish mentality in a city where Denmark finally conceded its superpower ambitions, and wander through the old castle or the royal palace of Gråsten. 56.711.5666671 Anholt – more than 45 km from nearest mainland and pretty much right between Sweden and Denmark, this secluded island offers the largest desert in Northern Europe and one of Scandinavia's largest seal populations. 55.32055615.1844442 Ertholmene – this small group of islands, governed by the Ministry of Defence, makes up for Denmark's most eastern land and home to a large a bird reserve, as well as old defence installations. 54.96666711.553 Femø – most famous for being one of the first bastions for the women's rights movement, it now attracts lesbians and feminists, while priding itself in welcoming all women. 55.4141678.4102784 Fanø – a 16 km long and 5 km wide island, with an unusual large mount of different natural environments on a small area: Sand, heath, meadow and pine wood. 57.48555610.6244445 Hirsholmene – a group of 10 small islands 7 km to the northeast of Frederikshavn, noted for its high population of birds, but also home to some excellent beaches and a relatively large number of World War II-era bunkers. 56.037112.31576 Kongernes Nordsjælland National Park – brand new national park covering the old hunting grounds of ancient kings. 57.26666711.17 Læsø – get away from it all in this remote island in Denmark's "desert belt", ride through the sand dunes on horseback and see unique farmhouses with seaweed roofs. 55.86666710.6166678 Samsø – Denmark's "greenest" island has garnered international attention since the heat and energy consumption on the island is exclusively produced locally by renewable sources. Samsø is home to the annual music festival Samsø Festival, sporting itself as Denmark's "hyggeligste" (i.e. most cosy). 55.279712.44629 Stevns Cliff – a 65 million year old cliff made up of lime and chalk, which stretches more than 12 km on the shoreline and up to 41m above sea-level. The Danes are first mentioned in writings from the 6th century, and became widely known in the Viking age, when they together with their Norwegian and Swedish kin travelled far for trade, raids and settling (cf the Danelaw in Britain). The Danish kingdom was established during the Viking age. Harald Bluetooth was christened and succeeded in christening his realm in the 960s. The kingdom was enlarged and in the 11th century his grandson Cnut the Great was king not only of modern Denmark proper, but also the Scanian lands of southern Sweden, Norway and larger parts of England (which were lost after his death). Extent of the Kalmar Union around 1400. Denmark continued its expansion, of which both the church and the Hanseatic League played important roles. In a combined effort to counter the rising power and influence of the Hanseatic League in the Baltic area, the Kalmar Union was ratified in 1397, unifying the Kingdoms of Denmark, Norway and Sweden under one rule. Due to a complicated succession of unfortunate deaths and possibly some intrigues, fifteen year old Eric of Pomerania became first official monarch of the Kalmar Union. 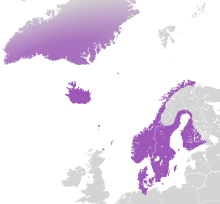 At the time of unification, the Norwegian Empire also included the North Atlantic Isles of Orkney, Shetlands, Faroes, Iceland and Greenland, while the Kingdom of Sweden included a large part of present-day Finland and the Kingdom of Denmark also included Holstein. There were several internal conflicts and uprisings in the following century, and in 1523, Gustav Vasa was declared king of Sweden and the union fell apart and ceased to exist. This was not a devastating loss for Denmark, which kept Norway (including the North Atlantic Islands), the Scanian lands and the economically important Danish straits under one rule. In the 1530s, Denmark had a Lutheran reformation and the king secured his monarchical power in relation to both the priesthood and the nobility. Trade and manufacture flourished. Copenhagen was ravaged by a series of very destructive fires in the course of the 18th century, some caused by naval attacks and bombardments. The Copenhagen bombardment of 1807 destroyed most of the city. During the succeeding centuries there were many wars, especially with Sweden, which established itself as a great power. Denmark was also involved in the Thirty Years' War, with little success. The Second Northern War dealt a very serious blow to the Kingdom of Denmark with Sweden emerging as the greatest military power in Scandinavia. Denmark ceded the Scanian lands, the Estonian possessions and a third of Norway in the humiliating Second Treaty of Roskilde in 1658 and now with Swedish forces occupying most of Denmark proper too. The occupied areas in both Denmark and Norway soon rebelled against the Swedish troops and succeeded in overcoming them, restoring Denmark-Norway in 1660. The Treaty of Copenhagen in 1660 settled the borders between Denmark and Sweden that we know today. The newfound military might and prowess of what now became the Swedish Empire, eventually provoked external forces and Russia initiated The Great Northern War in 1700, leading a coalition including Denmark-Norway against the Swedish territories. This led to a Swedish defeat and Russia was now the dominant military power of the Baltic area from 1721. This restored the power-balance between Denmark-Norway and Sweden and general peace lasted about a century, until the onset of the Napoleonic Wars in 1803. A series of very destructive fires, some caused by naval attacks, ravaged Copenhagen throughout the 18th century. The last of the great fires destroyed most of the city in 1807, when the British navy bombarded Copenhagen and destroyed the Danish fleet in a preemptive attack. Up on till then, Denmark had been firmly neutral in the Napoleonic Wars, but now sided with Napoleon and got involved in warring with Sweden once again. Even though the fighting with Sweden only resulted in status quo, the military expenses took a heavy toll on the economy and Denmark went bankrupt in 1813. In 1814, Norway, with the exception of the North Atlantic Islands, was ceded to Sweden as part of a larger European peace treaty. Still a great naval power, Denmark engaged in the general European colonialism from the 1660s onwards, establishing settlements, plantations and forts in new colonies in the Caribbean, West Africa and India. Denmark continued to profit from the global slave, sugar and spice trade for about 200 years, but the African and Indian colonies were eventually ceded to the British Empire in the mid-1800s and the Danish West Indies were sold to the US in 1917. On balance, the hard times after the Napoleonic Wars were a cultural golden age for Denmark, with intellectual and cultural giants such as Bertel Thorvaldsen, Hans Christian Ørsted, Nicolai Grundtvig, Hans Christian Andersen and Søren Kierkegaard. Compulsory education was introduced and the country took several steps towards democracy and rule of law, in great part as the result of political activity by liberal bourgeois groups. A democratic constitution was established in 1849 and the right to vote was given to men with their own property, aged over 30 or 40. In 1915, Denmark got a new constitution with universal suffrage. After the severe loss of territory, Denmark founded a unique non-aggressive kind of nationalism after the Napoleonic Wars in the early 1800s. Nicolai Grundtvig played a defining role in that movement in the first half of the 19th century. The new democratic movements in Europe were paired with the emerging ideas of national states and in Southern Jutland, this led to internal conflicts over the local feudal forms of rulership. Two wars were fought there, involving military forces from Denmark, Prussia, Sweden and Austria, eventually leading to another Danish defeat and now cession of Holstein, Schleswig and Saxe-Lauenburg in October 1864. Marked psychologically by the many military defeats and extreme loss of territory over the centuries, in combination with the growing influences of the national-democratic movement, Denmark practically gave up on military force as a political tool. But wars continued to rage in Europe and in 1914, World War I broke out. Denmark succeeded in being neutral, but as Germany got heavily involved, Danes from the ceded Southern Jutland were conscripted along with other German citizens and several thousand southern Danes fell at the Western Front fighting for Germany against their will. In 1920, after the World War, a referendum vote was eventually held in Schleswig-Holstein to settle the still unsolved internal conflicts and the northern part of Schleswig returned to Denmark once again while southern Schleswig and Holstein went to Germany, settling the Danish-German borders we know today. To this day a Danish minority lives in Southern Schleswig and a German minority lives in Northern Schleswig, now in peaceful acceptance. Danes celebrating the liberation of Denmark from the occupation of Nazi Germany during World War II on 5 May 1945 in the streets. Denmark tried to be neutral in World War II as well, but Germany invaded Denmark in April 1940. The defense was weak and there had been no proper mobilization, to avoid the horrors of a futile resistance. Iceland, still Danish, was taken by the UK a month later, without bloodshed, and was later handed to the USA. The Danish government agreed to the German conditions and by promising "loyal cooperation", the national authorities were permitted to continue their function, including sentencing anti-Semitic activists. The national government was replaced by German authorities in August 1943, as it had not acted to German satisfaction. When the Germans decided to deport the Jews to Germany, most succeeded in escaping to Sweden, in a big rescue operation organized by the Danish Resistance. A large number of those who were captured were closely monitored by the Danish Red Cross and partly thanks to Danish political pressure not deported to the German extermination camps. The majority of the captured Jews survived this way, but a few hundred, in addition to imprisoned Danish communists, were deported by the Gestapo to German concentration camps for detention, forced labour and execution unfortunately. With the growing intensity of sabotage by the Danish underground resistance movement, Gestapo (led by Waffen SS Dr. Werner Brest) increasingly ordered the Danish police to take counter measures, or face punishment. The organization of the Danish police was not cooperative with the Nazi agenda and the German reaction came promptly in May 1944 when around 2,000 officers were arrested countrywide and deported to concentration camps in Germany. The Danish government later succeeded in improving their treatment in German captivity, but around 100 died, the majority in Buchenwald. Denmark was liberated by British forces led by Field Marshall Montgomery on 5 May 1945, two days before the capitulation of Nazi-Germany. After the war, Denmark sought closer cooperation with the other Nordic countries, but was also among the founding members of NATO and the UN. Iceland declared and gained its independence whereas Greenland and the Faroe Islands were granted greater degrees of home rule. The Schleswig issue was further resolved to the satisfaction of most involved via a treaty with Germany guaranteeing cultural, political and economic rights to the minorities on both sides of the border. After being on the sidelines of European integration, Denmark finally joined the EU in 1973; however, the country does not participate in the Eurozone despite the Crown being pegged to the Euro. The weather in Denmark is relatively mild compared to other Scandinavian countries, but it is clearly divided into four seasons, each with their own characteristics. For a traveller it is important to know what to expect at the time of visit, how to dress and how to plan your stay. Snow cover is not always guaranteed during the winter months, but because of the northern position, daylight hours are with certainty much more scarce than the long pitch black nights. Even when the sun is supposed to be up, the skies are often depressingly grey with heavy clouds and almost no sunlight. These conditions persists for three months, December to February, and sometimes November and March as well. Once in a while a lucky day of four to five hours sunlight can be experienced, but the temperatures are usually around freezing point. For travellers, the Christmas month of December can however be interesting, as the centres of most larger towns are decorated and small shops pops up in the streets selling mulled wine, pancakes, sugarglazed almonds and other local delicacies. Winter is certainly a time best spent socialising indoors. Spring starts in late March or April and the daylight hours increase quickly as well as the temperatures. Warm clothing is still a must and rainwear is also recommended. This is a time when many people catch a cold, because they let their minds be tricked into thinking summer has arrived as soon as the sun has shone for a couple of days straight. Not yet. May is when the trees burst into leaves and a beech forest in leaf-burst is an experience never to forget. With June, summer has arrived and now the daylight hours have outpaced nighttime by far. Late June holds the longest day of the year, with as much as 18 hours. The sun sits lower on the horizon on these latitudes however and not all hours are as bright as mid-day, but the Danish summer is indeed characterised by "bright nights" (Danish: lyse nætter) and outdoor activities and parties can easily continue into the wee hours without anyone noticing what time it is. If you need to readjust your inner clock after a longer flight or if you have early morning meetings and appointments, it will be a very good idea to bring a sleeping mask to block out the light. The summer temperatures in Denmark are mild; it is seldom too cold (so you would need a warm coat) and it is very rarely excessively hot (above 30-32 degrees Celsius) so you cannot engage in any outdoor activities. You might think these conditions makes for the perfect summer, but then you need to know that the weather changes almost unpredictably. Rainy and cloudy days can come and go throughout the summer, so if you visit during this season, it would be wise to plan accordingly; be sure you can change your outdoor plans for indoor activities whenever bad weather strikes, and you will get the most out of your time. Even though grey, cloudy and rainy days or a sudden burst of thunderclouds can ruin your beach or picnic plans, you can largely rely on the weekly local forecasts. Changes usually happens on a day-to-day basis only, so looking at the skies in the morning will give you a good and reliable idea of what the coming day will be like. In September autumn slowly starts to arrive, but bright, sunlit days can often be experienced through October and these months are also a good time to visit. Just make sure to bring proper clothes, as colder and windier weather becomes increasingly common. November marks the definite end of any summer, the trees are all in red, yellow and orange now and soon chilly autumn winds will blow the leaves off. Denmark is very flat and has the largest fraction of cultivated land in the world. Denmark has a flat terrain. More than 60% of the landmasses are flat, arable land, making it ideal for farming. And an additional 15% or so are similarly flat forests. Thus Denmark is home to the 'lowest-highest' point in Europe; at a "stunning" 170.86 m above sea level, Møllehøj, near Skanderborg, was in 2005 confirmed as the highest natural point in Denmark. More famously Ejer Baunehøj and Yding Skovhøj with 170.35 m and 170.77 m respectively had been competing for years, until in 2005 with a new technique the winning hill could be found. Either way, the 216 m high Søsterhøj Transmission Tower near Aarhus reaches the giddy height of 315 metres above sea level and is, therefore, the highest point in Denmark. The mountains in Sweden and Norway shield Denmark from most of the stormy weather and freezing winter air. Combined with the mild temperature and high degree of moisture in the winds blowing in from the North Sea it makes the land well suited for agriculture as the seasons are smoothed, and seldom creates droughts or floods. Bornholm is one of the few exceptions to the overall farming friendly terrain, as the depth of the soil is reduced, and bedrock can be seen in multiple sites. The west coast of Jutland facing the North Sea is slowly eroding, and accumulates the eroded soil due to the currents in the ocean. The result forms wide sandy beaches, whereas the east coast of Jutland in general is covered with pebble beaches. Sports are popular in Denmark, with association football reigning supreme in popularity and counted as the national sport, followed by gymnastics, (Olympic) handball and golf. Along with the other Nordic countries as well as Germany and France, Denmark is among the Handball superpowers and matches among those teams or world and European cups are closely followed by Handball enthusiasts. Another trait of Danish culture as any tourist pamphlet will tell you, is "Hygge", which translates as something like "cosy" or "snug". Danes themselves will be quick to point out this is somehow a unique Danish concept, which is hardly in tune with reality, but it does probably take a more prominent place in the culture than in many other countries. It usually involves low-key dinners in people's homes, with long conversations over candlelight and red wine in the company of friends and family, but the word is broadly used for social interactions. Another important aspect of Danish culture is understatement and modesty, which is not only prominent in Danish behavioural patterns but also very much an important trait in the famous Danish design, which dictates strict minimalism and functionalism over flashiness, something that transfers well to the Danish people as well. The Danes are a fiercely patriotic bunch, but in a sneakingly low-key kind of way. They will warmly welcome visitors to show off the country, which they are rightly proud of, but any criticism - however constructive - will not be taken lightly, although most Danes will happily spend hours to prove you wrong over a Carlsberg beer, rather than becoming hostile. It will not get you far though, and if you manage to convince anyone of any other flaws than the taxes being too high, the weather too bad, or other trivialities, you should immediately return home and run for political office. For the same reasons outsiders on long term stays are by many viewed with a certain amount of suspicion. As the homogeneous society is often thought to be the key to Denmark's successes, you will often hear resident foreigners complain about a constant pressure to become ever more Danish, and the anti-immigrant Danish Peoples Party have seen increasing popularity over the years, taking 21% of the votes at the latest election, making it Denmark's 2nd largest political party. As a traveller it is therefore likely that Danes will be friendly and helpful towards you, but rarely engage in contact and conversations with you on their own initiative. Often the people can be seen as cold, sceptical and even a bit rude, but it is only on the surface. It can take time to truly befriend a Dane. If nothing else, hit any bar in town and you will be greeted warmly when the first few beers are put away. Drinking alcoholic beverages is, however strange it can seem, a key component in the social life there. Especially when comparing with the other Scandinavian countries, Denmark has a very liberal attitude to alcohol consumption, both in terms of what is socially and legally acceptable. For many social gatherings alcohol is a must (during weekends) and is seen a positive driver for loosening the atmosphere. Engaging in drinking is most likely the best way to get to know a Dane. There are many wind farms in Denmark, several of them offshore. Denmark is often praised as being one of the greenest countries in the world, but apart from the ubiquitous bikes, the individual Danes are surprisingly nonchalant about the environment despite their reputation, and are actually responsible for as much greenhouse gas emission as most other nationalities. As with so many other things, it is thought as a collective responsibility, and have safely been played into the hands of the government, which in turn, with great success under Social Democratic leadership, enacted a series of reforms, mainly green taxation, between 1993-2001, that made Danish society as a whole (especially in industrial production) one of the most energy efficient in the world. As it turned out, it was also good business, and green technology has become one of the country's largest exports, including fields like thermostats, wind turbines and home insulation. Because of this, green policies enjoys unusually broad support among the people and the entire political spectrum. 20% of overall energy productions comes from renewable energy, mainly wind power, a feat mainly made possible by the common Nordic energy market and a technologically advanced international power grid. Apart from the Danish wind energy, this grid is also hooked up on the massive hydro energy resources in Norway and Sweden, some of Sweden's nuclear energy, and it can easily be regulated up and down to outbalance the unreliable wind production. Wind turbines in general produce more power during the night than the Danish companies can consume, while not producing enough in daytime to cover the consumption. The installation of solar power in domestic houses has been supported by targeted tax reductions to create a secondary renewable energy source that is active during the days hours. As a backup the old coal and oil based power plants are kept ready for production, and black or brown outs are unthinkable for the Danish population. Apart from energy production and efficiency, the green areas of sustainability, re-use and organic production is also of a high priority and has largely been implemented in everyday life. The Danes have the worlds second highest consumption of organic products, relative to the size of the population, right behind Switzerland. Almost all stores and supermarkets sell organically certified alternatives. Plastic bags cost money; 1-5 kr - non-refundable, so bring a reusable bag when shopping groceries. Cans and bottles have 1-3 kr deposit, refundable any place that sells bottled drinks. There is a roughly 100% (4 kr) tax on gasoline, the total price usually hovers between 9-11 kr/L. For the environmentally conscious or just gastronomically interested traveller, it might be worth noting that the rise of organic farming in Denmark has nurtured a thriving and lively grassroots food culture throughout the country with many regional specialities of a high quality. This comprise all kinds of agricultural organic products and you can buy them, especially farmers produce and dairy, in all larger retail stores and at many farms. Knuthenlund on Lolland is one of the largest organic farms in the country, specialising in biodynamic production of both meat and vegetables, with 50,000 visiting guests each year. Organic is called Økologisk in Danish and organic state-certified products are labelled with a red Ø. When shopping for imported products, look for the EU-certification, showing small yellow stars outlining the shape of a leaf. Carnival (Fastelavn) is held in late winter, seven weeks before Easter sets in. Almost exclusively festivities for children. Special cakes known as fastelavnsboller is sold in bakeries. Easter. Almost everything closes down across Denmark with empty streets throughout Easter, as people gather for private get-togethers which for some includes church going. Special Easter-brews (Påske Bryg) are issued each year. International Workers Day is celebrated 1 May. Danes get the afternoon off, while many arrange for an entire day off. Outside gatherings across the country in city parks and event venues with concerts, speeches and get-togethers. June 5. is Grundlovsdag, the Danish constitution day. Danes get the afternoon off, some get all day off. Politicians and organizations talk at outdoor meetings all over Denmark. It is all very relaxed, no fireworks or animated debates. Except for convenience stores and small supermarkets, no stores are open. Fall. The forty-second week of the year is the fall holidays for school children. Historically it was the potato holiday. Most parents will arrange to have week 42 off as well. This means that you can not expect low-seasons prices this week. On the other hand, many museums and attractions will extend their opening hours or open up again even if they had closed for the season. Make sure to make reservation for ferries, trains, etc. J-day, first Friday in November. This is the day when the Christmas beer is released. Go to any bar and party with the Danes. When the beer truck arrives you might get a free Christmas beer and a Christmas beer hat. Christmas. Throughout the month of December, Christmas-related events and street decorations pop ups. Christmas dinner parties (julefrokost) are arranged with colleagues, friends and relatives. New Years Eve (Nytårsaften). Lively partying all over including some special traditions. Firework displays, in particular at midnight. Many people gathers in the town centres around midnight to participate in the festivities and celebrate the beginning of the new year. Denmark is not only the gateway to Scandinavia in cultural terms, but certainly also geographically, and as such the country is well connected with the rest of the European continent and to Scandinavia. A plethora of ferries connects Denmark with Europe and Scandinavia, and Copenhagen airport even more so serves as the main Scandinavian hub, since its southern latitude makes it a natural stopping point for flights between Scandinavia and the rest of Europe. Citizens from Schengen countries are permitted to work in Denmark without the need to obtain a visa or any further authorization for the period of their 90-day visa-free stay. However, this ability to work visa-free does not necessarily extend to other Schengen countries. Additionally, citizens of Australia, Brazil, Canada, Chile, Israel, Malaysia, New Zealand, Singapore, South Korea, and the United States are permitted to remain in Denmark for up to 90 days without a visa, regardless of the amount of time spent in other Schengen countries (time spent in Sweden, Norway, Finland, and Iceland, though, does count against this 90-day exemption). You can apply for a visa at your local Danish embassy (list), but in many countries where Denmark has no consular representation, other Nordic (Scandinavian) embassies (Sweden, Norway or Finland) are usually authorized to handle visa applications (see list). Further details are available at the Danish immigration services. The other nations of the Danish commonwealth, Greenland and the Faeroe Islands, are not Schengen or EU members. If you can visit the Schengen area without a visa, you can visit Greenland and the Faeroe Islands under the same rules (90 days in a half year), citizens of the EU/EEA have unlimited access. If you need a visa for the Schengen Zone, you will need a separate visa for Greenland or the Faeroe Islands - be sure to inform the Danish embassy when you apply for your Schengen visa that you are also visiting these areas. Denmark is served by two major and several minor airports who nearly all offer international connections. Most European airlines offer routes to Copenhagen, and many also to Billund, but SAS Scandinavian Airlines remains the dominant carrier. Key players in the low-cost market include Norwegian, Easyjet, Transavia and finally Ryanair. Copenhagen Airport (CPH IATA) is the largest airport in Scandinavia. The airport is located at the town Kastrup on the island Amager, 8 km from central Copenhagen. The airport is connected by train to Copenhagen Central Station and beyond, Malmö and other towns in Sweden. One way fare to Copenhagen Central station is 34 kr and the train leaves every 10 minutes. Buses and taxis are also available. Billund Airport (BLL IATA) in South-Central Jutland is Denmark's 2nd largest airport, and the main airport for the entire peninsula. It fields flights to major European hubs: Frankfurt, London and Amsterdam, many European capitals, the Faeroe Islands as well as south European holiday destinations. Located in the town Billund, 29 km from Vejle, 65 km from Esbjerg, 104 km from Odense, 100 km from Aarhus, 210 km from Aalborg, and 262 km from Copenhagen. The airport is connected by buses to major cities and towns in the region. Taxis are also available. Aalborg Airport (AAL IATA) about 7 km east of the city centre, is Denmark's 3rd largest airport with flights to around 20 European destinations, including Oslo, Reykjavik and the Faroe Islands as well as major hubs like London, Paris, Amsterdam, and Istanbul. Major carriers includes Norwegian, SAS, Turkish Airlines, and Atlantic Airways. Many routes are limited within seasons. Aarhus Airport (AAR IATA) is on the Djursland peninsula 44 km north east of Aarhus, 50 km from Randers, 90 km from Silkeborg, 99 km fra Horsens, 98 km from Viborg and 138 km from Aalborg. An airport shuttlebus connects the airport to Aarhus Central Station from where you can reach the rest of Jutland by Train. Non-national carriers serving Aarhus airport are Ryanair, British Airways and Finnair. Malmö Airport (MMX IATA) is located 61 km from Copenhagen in southern Sweden and offers low-fares flights with Wizzair to Eastern Europe and Ryanair to London (Stansted), Poland and Spain. An Airport shuttle bus connects the airport with Copenhagen central station. FlyBus charges UK₤10 or 100 kr for the ride. Denmark is directly connected to the German Autobahn on route E45 (German route 7), which passes close to Hamburg and runs along the east coast of the Jutland peninsula, all the way to Frederikshavn in the North, passing through Denmark's second city Aarhus along the way. Many drivers going from Germany to the Danish capital opt for one of the regular car ferries, which shortens the trip by 137 km from Hamburg and 309 km from Berlin respectively, and avoids the kr 235 bridge toll, so the price of the ferry crossing is nearly offset by extra gas needed to take the long way around. From Sweden catch route E20 from Gothenburg (312 km) or E4 from Stockholm (655 km) to Malmö and connect with the Øresund bridge (325 kr). Many Norwegians also opt for this route when going to Copenhagen, but there are several car ferries crossing the strait between the two countries, especially to Hirtshals on the north tip of Jutland, which is connected to the Danish highway network. If you are in one of the neighbouring countries, long distance buses offer a good economical alternative to trains. From Germany several bus companies operate routes from Hamburg and Berlin to Copenhagen and Aarhus. A trip from Berlin to Copenhagen can cost as little as 200 kr, but normally will set you back around 300 kr (€40) and take around 8 hours. Another popular route Hamburg to Aarhus takes around 5½ hours. Check out the following companies; Flixbus, Eurolines, and Abildskou. Many of the companies running Intercity buses in Germany also serve stops in Denmark. For Scandinavia there are three daily connections and a night-bus from Gothenburg (4½ hours) and Oslo (8 hours), and two daily buses from Stockholm (9 hours) divided into a day and a night bus, check out GoByBus and Swebus for prices and schedules - when searching it might be useful to know Copenhagen is Köpenhamn in Swedish. Due to the Bosnian war in the 1990s there are several bus companies serving the Bosnian diaspora, which provide a cheap and clean way of getting to the other side of the European continent. Toptourist and Autoprevoz runs from various destinations in Bosnia and Hercegovina and Serbia to Denmark, Off-season approx 1,000 kr for a return ticket. The fastest way between Norway and the continent are through the Danish highways, this has ensured frequent ferry connections to Norway, with the busiest port being Hirtshals, from where a trip to Norway takes as little as 3½ hours. Other busy routes are the Rødby-Puttgarden ferry - the fastest route between Sweden and Copenhagen to continental Europe - which remains one of the busiest ferry crossings in the world (though a bridge is on the drawing board). An alternative route from Poland to Zealand is from Świnoujście via the ports in Ystad or Trelleborg in Sweden and the Øresund Bridge. Ferries are generally of a very high standard and safety regulations are strictly adhered to. Long distance train travel is done with DSB, the Danish State Rail system. A number of long distance bus companies also operate. Each region in Denmark has its own local public transportation company. For public transportation (trains, buses and ferries) use the online travel planner Rejseplanen. There are two ways to buy tickets. For local trips you can buy a ticket from the regional transportation company based on a zone system. This ticket is valid on all public transportation including DSB trains for one to two hours (depending on the number of zones you travel). Most public transportation companies offer a number of passes which can save you a substantial amount on transportation. Rejsekort is an electronic ticketing system. For travellers it could makes sense to get the Anonymous prepaid card. The personal version will be expensive and take several weeks to obtain. The card costs 80 kr which is not refundable, and the balance on the card must be at least 70 kr when you start a trip (600 kr for inter-regional trips) which make it hard to end up with an empty card; but maybe you can pass the card on to a dane when you leave. But the discounts are substantial so if you plan more than a few trips it is probably worth it. Several travellers can share the same card (on busses you have to tell the driver that you are more than one using the same card before you). Long distance bus-service between Jutland and Copenhagen used to be a matter of preference rather than cost, but a number of low cost bus lines have begun crossing the country at much lower prices, albeit also at a much more limited schedule. Abildskou is the established long distance operator with up to 9 departures each day to various city's in Jutland. Most departures uses a fast ferry connection across the Kattegat sea. Prices range from 150 kr for a limited number of discounted tickets, to 300 kr for a regular ticket. Rød Billet Tickets range between 99-180 kr, but departures are limited to 1-4 per day. Crosses the Great Belt bridge. The primary Danish train company is Danish State Railways or DSB. Many feeder lines for the principal train line in eastern Jutland are now operated by British company Arriva, a subsidiary of Deutsche Bahn. Some small rail lines are operated by other companies. DSB also operates the S-Tog commuter rail system around the greater Copenhagen area. Eurail passes are valid on all DSB and Arriva trains. Danish trains are very comfortable, very modern and very expensive. To ensure on-time departure, the doors of the trains are closed and locked in stages between one minute and 15 seconds before scheduled departure time. Tickets can be purchased at station ticket offices, from vending machines in the stations (valid for travel only on date of purchase and with time stamp) and via DSB's website. Most trains have 230 V power outlets. Wi-Fi service is available on most trains between Copenhagen and Aalborg. Internet access is included on first class tickets and on standard class 7 hours access can be bought for 29 kr with a credit card. If you are not travelling on a rail pass, try asking for an Orange ticket, these are a limited number of heavily discounted tickets that are available on most departures. They are often sold out way in advance, but it never hurts to ask - and you do need to ask, in order to get the discount. Senior citizen tickets (65 billet) offer 25 or 50% discount (depending on day and time of travel) on all departures for residents of Denmark aged 65 and over, but it does not hurt foreigners to ask. All trips with trains and local buses can be scheduled electronically through Rejseplanen.dk. The express trains marked as ICL (InterCity-Lyntog, or 'lightning train') are the fastest, but also the most popular, so seat reservations are highly advisable. Ordinary InterCity trains are generally less crowded, and the time difference is often negligible on trips of an hour or less. While the rail network had been neglected for decades with both the overall network density and electrification below the standards of Denmark's northern and - especially - southern neighbors, there has been a lot of investment since about the 1990s. Among other things the connection to Germany is planned to be upgraded and expanded with a new tunnel across the Fehmarn Belt to open in the 2020s or 2030s and there is ongoing construction for a Danish high speed rail line to open in 2019. Even if travel times are up to 5 hours, there is no sale of food onboard. Buy something to eat and drink before longer journeys. The only way get to most of the smaller islands is by ferry. There are 55 domestic ferry routes in the country. The two most important ferry companies are Rederiet Færgen and Mols Linien. Ferries are the best way to get to Bornholm, a Danish island in the Baltic Sea, although it also can be reached by plane. Since the opening of the bridge to Sweden, the easiest route from Copenhagen to Bornholm is by train and then ferry from Ystad. Through tickets are available between Copenhagen and Rønne (booking is mandatory). There is also a bus that serves this route - Gråhund Bus 886 from Copenhagen to Ystad, where it links with the ferry to Bornholm. The Marguerite Route sign - an indication of a scenic route. Driving in Denmark between cities is very easy, with well-maintained roads everywhere. Danes generally drive by the rules, but may not be very helpful to other drivers in ceding right of way, etc. and stick very rigid to keep to their rights. There are no toll-roads except the two big bridges: Storebæltsbroen between Zealand and Funen (215 kr one way), and Øresundsbron between Copenhagen and Malmö (235 kr one way). Touring Denmark by car can be a wonderful experience and highly recommended. Margueritruten (The Marguerite Route) is a 3500 km long connected route of small scenic roads passing 100 important Danish attractions. It is marked by brown signs with the white Marguerite Daisy flower and is also marked on most road maps. When entering Denmark by motor vehicle, you will be met by a sign like this, with simple instructions, at the border. Unless otherwise posted, speed limits are 130 km/h (80 mph) on the motorways, 80 km/h (50 mph) outside build-up areas and 50 km/h (30 mph) in build-up areas. Vehicles with caravans or trailers as well as trucks are limited to 80 km/h on motorways, 70 km/h on roads outside build-up areas and 50 km/h in build-up areas, even though other speed limits may be indicated. Speeding occurs frequently, especially on motorways, though dedicated efforts by the Danish police on speeding, has made more people aware of speed limits. Trucks in Denmark generally do about 90 km/h on motorways and trucks overtaking each other on long stretches of motorway (colloquially known as elephant races) occurs frequently. Fines ranges between 500 kr and 10,000 kr and a driving ban in Denmark. Wearing seat belts in cars and vans is compulsory (if fitted), and children under 135 cm and or under 3 years of age, must use approved safety seating devices adapted to their height and weight. Headlights must be switched on when driving at all times (and dipped during sun hours), regardless of weather conditions or whether it is a night or day, so switch them on. Drivers and passengers of motorcycles and mopeds must all wear full face helmets. Though required under law, little use is made of indicators on roundabouts, so generally if the car is not indicating it is leaving the roundabout, give way as it is invariable going round. When changing between lanes on motorways use of turn signals prior to- and during the lane change is mandatory. On open roads, especially those with an accompanying cycle path, expect drivers turning right to come to an almost dead stop to check that they are not cutting in front of a cyclist, even if there is no way even an Olympic cyclist could appear from nowhere on an entirely cycle free horizon. Right turn on red is not permitted. Denmark allow drivers to have 0.05 percent alcohol in the bloodstream while driving (for most people this is equivalent to having consumed one drink or less), and Danish police is very aware of possible drunken drivers. Fine is calculated as (percent of alcohol in blood) × 10 × (your monthly salary before tax). Watch out for the bicycles in the cities, especially when turning across bicycle lanes, the bicycles always have right of way. Special care should be taken at Roundabouts! Cyclists in general seem suicidal to drivers from other countries, as they will not look, or slow down if turning onto the road in front of you. After sunset, lights on bikes seem to be voluntary - especially in the bigger cities - even though it is in fact compulsory. You must always carry your driving license, vehicle registration document, and certificate of motor insurance in the car. It is compulsory to have a warning triangle in the car, and to use it if you experience breakdowns on highways or on regular roads where you are not able to move your car out of the way. The road signs in Europe differ substantially to those e.g. in the Americas. The warning signs are triangular but have symbols that should be understandable. These are some European signs that could need explanation for foreign visitors. Ease of driving inside cities is a different story. Congestion in and around the major cities, especially during rush hours can be a trial for some people. If you are in your own car, it is wise to park it in a convenient central place and walk or use public transport, bike or taxi to get around the big cities. Most parking areas requires the use of parking discs/parking clock faces (in Danish parkeringsskiver or "P-skiver" in short) which must be placed in the right side of the front window, with the clock facing out of the window and the hour hand set to the time you park (there is no minute hand). The rules state that the hour hand should be set to the next "full" quarter hour. If you for instance arrive at 13:16 at a parking space with 30 minutes parking you should set the parking disc to 13:30, and you will only be due back at your car at 14:00. Some places require a parking ticket from a nearby parking ticket vending machine to be placed in the car, in the lower right corner of the dash-board, readable from outside the car. Some more modern parking ticket systems allow the purchase of parking tickets using text-messages from cell-phones, though this can be a very expensive affair from foreign numbers. The majority of the parking ticket vending machines, accepts international credit and debit cards, however this is still a large quantity that only accepts Danish national credit cards or coins. In some areas - especially in the Copenhagen area - have multiple vending machines with different parking coverage. In this case the coverage is indicated with a map on left or right side of the machine. Be sure to check that the machine actually covers the area you have parked. Renting a car is a convenient, efficient and though relatively expensive way to explore Denmark, especially if you intend to visit more remote areas, where train and bus services may be less frequent. Prices starts about 400 kr/day at the big car rental chains, but with limited mileage, typically 100 km per lease and an additional 25 km/day. It is not uncommon for the car rental chains to require the drivers to be at the age of 21 or higher and require that payment be done with an international credit card. If you are not a resident of Denmark you can rent a tax-free car at major companies from approx 230 kr per day with free mileage. If you order online, make sure that you are not booking as a resident of Denmark. Be aware that Denmark is no exception to the widespread scam of adding hidden charges to your car rental bill, and not including services like auto assistance. Also, unlike other goods and services, quoted car rental rates may not include the 25% VAT or sales tax for purchases by private people. Carefully read the rental agreement before you accept your car. If you need auto assistance, you should generally inquire with your insurance company, as they will usually have made arrangements with a local company. If they have not, try one of the following companies, but expect to pay €100-300 for a simple service like towing to nearest shop. Falck, ☎ +45 70 10 20 30. Dansk Autohjælp, ☎ +45 70 10 80 90. Roadspace reserved for cyclists is prevalent in all Danish towns. Biking in Denmark is, in general, safe and easy. Drivers are used to bikes everywhere, and all major cities have dedicated, curbed bike lanes along the main streets. Denmark is quite flat, but can be windy, cold or wet on a bike. Bikes are generally allowed on trains (separate ticket sometimes needed). Biking on the expressways (Da: motorvej) is prohibited, and this also includes the Great Belt Bridge and the Øresund Bridge. Trains can be used between Nyborg and Korsør and between Copenhagen and Malmö if you need to cross the bridges. Official marked routes across the country can be found on . It is quite easy to hitchhike in Denmark. People who pick up hitchhikers usually speak English. Destination boards are recommended. For safety reasons, it is illegal to hitchhike on the expressways, so it is better to use the on ramps and service areas. When crossing by ferry, try to get into a car that already paid for the ticket. If you hitchhike from the southern part of Denmark (direction from Hamburg or Kiel, Germany), and continue in direction to Copenhagen, make sure the driver does not stop in Kolding. If he does, ask him to stop at the last gas station before Kolding. On the Kolding expressway crossing there is no place to hitchhike and it is one of the worst places in Europe for hitchhikers. Check out the Tips for hitchhiking article here on Wikivoyage if you are new to hitchhiking. Scandinavian Airlines and Norwegian operate domestic routes, both of them either from or to Copenhagen Airport. There are no domestic routes between regional airports. Since most of the country's airports were built as military airfields during the Second World War, they are often inconveniently located far from town centres which, as a general rule, makes train travel nearly as fast from town centre to town centre for destinations less than 3 hours by train from Copenhagen. For destinations further afield, trains will often get you where you want to go a lot cheaper. But competition is heavy and it is sometimes possible to find plane tickets cheaper than the train if you book well ahead of your planned departure or can travel at off-peak hours. This is especially true for the Copenhagen - Aalborg v.v. route which have the most competition. Some of the more remote islands, if there is any such thing in a country as small as Denmark, also sees regular taxi flights from Roskilde airport to their small airfields, on-board small propeller aircraft. The most trafficked route are between Roskilde and the islands of Læsø and Anholt, where there are daily flights bookable on-line or by phone. These flights tend to be fairly expensive though, with the price hovering around 1,000 kr for a one-way ticket. Denmark's national language is Danish (Dansk), a Scandinavian language rooted in Old Norse. For this reason, modern Danish is similar to Norwegian Bokmål and somewhat to Swedish, and is to some extent intelligible to speakers of those languages, especially in written form. However, its sound is more influenced by the guttural German language, rather than the lilting languages found to the north and understanding spoken Danish may be a trace more difficult to those who only speak Swedish or Norwegian. English is widely spoken in Denmark with close to 90% of the population speaking it, many at a high level of fluency. As a foreigner you will get no extra points for trying to speak the native language, and Danes in general have limited patience with non-fluent speakers. So except for a few words like Tak (thank you) or Undskyld (excuse me), English-speakers are much better off just speaking English than fighting their way through a phrasebook. The Danish language has no equivalent to the English word "please" so at times it may seem as though Danes are rude when speaking English. More than 58% of the population has a good knowledge of the German language. It is widely spoken among seniors and especially in Southern Jutland (Sønderjylland / Northern Schleswig), where it has the status of a minority language. Elsewhere in the country, many people prefer to speak English, even when they do have some command of the German language. French is also spoken by some people, as all Danish students receive at least three years of lessons in one other foreign language than English, but given the Danes' limited contact with the French language in daily life, fluency tends to be lagging. Foreign television programmes and films are almost always shown in their original language with Danish subtitles. Only children's programmes are dubbed into Danish. The list on the right only includes commercial tourist attractions, where numbers of visitors are registered, and excludes concert halls, theaters and natural sites for instance. Many other official lists exist, differing depending on the selection criteria. While most of Denmark's land area is used for farming, there are spots of nature, including five established national parks, where Eurasian wildlife can be found. Although not well known to casual visitors, Denmark is an island nation, with 72 inhabited islands and a further 371 uninhabited ones. Apart from the well known blockbuster Bornholm, with its rich history, mystic round churches, many of the small islands are rarely visited by tourists, even though they make up for some of the country's most intriguing destinations. If you have the time consider visiting one of the two remote islands in the Kattegat sea - Læsø and Anholt, which locals jokingly refers to as the "Danish desert belt" since it sees much less rainfall than the rest of the country, and have large swaths of sand dunes covering much of the two islands, peculiar architecture and a laid back vibe. Also worth considering is the Island sea south of Funen, one of the country's most beautiful areas, which also includes the larger islands of Langeland and Ærø with some impossibly picturesque villages, lush green and hilly farmland and wild horses, and Samsø, geographically in the centre of the country, which boasts numerous beautiful villages and a yearly music festival (Samsø Festival) in the summer. Finally, in South Jutland, the islands of Fanø, Mandø and Rømø are located in the Wadden sea, an inter tidal zone forming a shallow body of water with tidal flats and wetlands. It is rich in biological diversity, with seals and an amazing range of birds, but also have some spectacular beaches and cute villages. Much has happened since the Danes were wreaking havoc to the coasts of Europe, but the more peaceful modern version of the Danes still take immense pride in their Viking heritage. The most visual heritage is the burial mounds dotting the landscape everywhere in the country (actually, most of these are from the earlier Bronze Age period), but there are a few attractions for the inclined to visit. Easiest and perhaps most interesting are the two museums near Roskilde, easily reached on a day trip from Copenhagen - the Viking ship museum is extraordinary with some well preserved ships and the Lejre Experimental Centre, a living history museum with a recreated Viking village. Still on Zealand but a further west in Slagelse, is the remains of the once mighty Trelleborg Viking ring castle and some reconstructed long houses. In Jutland there is another ring castle ruin near Hobro, Fyrkat, including 9 reconstructed farmhouses. Further south is Jelling, home of a pair of massive carved runestones from the 10th century, one of them celebrating Denmark's conversion to Christianity - the end of the Viking age. Still in the South, but along the West coast, Ribe (the oldest city of Denmark) is home to both a Viking Museum and a Viking experimental centre. The National Museum in Copenhagen, also has a good collection of Viking artefacts. The city of Frederikssund holds an annual outdoors Viking play from the summer solstice and a few weeks forward. Mainland Denmark has 3 world heritage sites; The Jelling rune stones date back to 900's have been called "Denmark's Birth Certificate", testifying to Denmark's conversion to Christianity around that time, it was erected by what is considered the first official king of Denmark, Gorm The Old, whose son is buried in another of the sights, Roskilde Cathedral, the first Gothic church in Northern Europe build of brick, and the final resting place for most Danish kings and queens ever since. The third, and possibly most famous, is Kronborg castle in Elsinore, home of Shakespeare's Hamlet, prince of Denmark, but also an impressive castle in its own right, guarding the main route to the Baltic sea. Denmark is renowned for its design heritage made famous by well-known designers, architects and companies as such. It is often described as minimalistic and functionalistic in its approach and includes names such as Jørn Utzon, Arne Jakobsen, Hans Wegner, Poul Henningsen, Georg Jensen, Bang & Olufsen, Royal Copenhagen, and many more. Architecture, furniture, industrial design in general, and the people behind it can be seen and explored many places throughout the country. A good place to start is Danish Design Centre, Danish Design Museum and Danish Architecture Centre, all in Copenhagen. Throughout Copenhagen and its surroundings, many examples of great Nordic architecture can be experienced. Other sources to be mentioned are the Trapholt Museum in Kolding, the Struer Museum (mostly Bang & Olufsen), the Jørn Utzon dedicated museum in Aalborg, the city hall of Aarhus. For excellent guiding and suggestions for architecture tours, see Danish Architecture Guide. When public events are arranged, it is customary to find ways to engage people of all ages and economic capabilities, so whether you travel alone, as a family, young, old, handicapped, on a splurge or a budget, you will find interesting activities and events to have fun with and participate in. Many places have special discounts for kids, groups, students and pensioners, and children are generally welcomed everywhere. In some people's minds (mainly in the countryside, less so in the cities) the inclusiveness and egalitarianism should only pertain to "the Danish tribe" or those who pay high taxes. A contradiction in terms you could say, but these ideas have nevertheless affected Danish society to some degree in the 2000s, mirroring a similar development in Europe and the Western world at large. As a traveller, however, you should not expect to deal with or experience this at all; the values of inclusiveness, equality and egalitarianism are firmly established in Denmark and at the core of Danish culture. The weather in Denmark is a bit unreliable, so if your plans include outdoor activities, it can be a good idea to have alternative indoor activities as a backup. If you don't mind a day or two of grey weather and a few drops of rain, just make sure to bring a raincoat along. Billetnet. Books larger concerts, theatre plays, sporting events etc. You can book online or in any post office. If you book online you can have the tickets mailed to you or you can print out a confirmation and exchange it for a ticket at a BilletNet office or at the scene. NaturNet. Lists nature oriented events such as mushroom collection, geology tours, etc. Many of the tours are free. Denmark has a very long coastline and sandy beaches are prevalent. With a 7,400 km coastline, almost the same as Brazil's and longer than India's, you are never far from a beach in Denmark. Nearly all are publicly accessible and many beaches are world class, with unbroken white sand for miles to an end. Some popular spots have lifesavers and other facilities in the summer months and there are several beachparks and sea baths as well, like Amager Strandpark (beachpark) in Copenhagen and Den Permanente (seabath) in Aarhus as fine examples. Denmark's beaches are popular destinations not just for Danes but also tourists, some of which has beach vacations as first priority even. Each summer, particularly the west coast of Jutland, is subjected to a veritable invasion of more than 13 million German tourists, usually in the many vacation homes dotting the coast there from north to south. The weather in Denmark can be tricky and unreliable; one day it is hot and sunny, the next it is grey and chilly, perhaps even raining, so bear that in mind and plan accordingly and you will make the most of your visit. Water temperatures are usually around 14 degrees Celsius in mid-June and gets slightly warmer from there through September. The shallow waters of Kattegat warms up a bit quicker than the North Sea coast of western Jutland however. The summer weather in Denmark varies widely from year to year and sometimes from week to week which means that the number of bathing days range from zero to more than thirty. A bathing day officially arrives when the average of seawater temperatures measured at a depth of one metre across the country reach 19 degrees Celsius or more; however, seawater temperatures of 14-19 degrees Celsius are warm enough for taking a dip in the waves. The water quality is usually fine in all of Denmark, but you can follow important data on-line at The Danish Nature Agency, including safety guidelines. Some coasts in Denmark have tricky or outright dangerous currents that are important to be aware of; a number of unlucky (or badly informed?) tourists drown each year. Roskilde Festival (June/July). One of the big four rock festivals in Europe, run by non-profit organisation. 80,000 tickets sold and more than 110,000 participants in Roskilde. Skanderborg Festival (August). The 2nd largest rock festival with 45,000 participants, in a unique location inside a historic forest by the lake shore near Skanderborg. Langelands Festival (July/August). A family oriented festival on the island of Langeland, 20,000 participants. Copenhagen Jazz Festival. (July) - One of the worlds top Jazz Festivals, with small and big concert all over the Copenhagen, attracts over 20,000 spectators. Tønder Festival (August). A large folk and country music festival held in Tønder in South Jutland. Aarhus Festuge (August/September). 10 days of music and cultural events in the city of Aarhus, with a different theme each year. Grøn Koncert. (July) - A one-day festival hosting some of the biggest Danish acts. The show travels around the country, usually taking place at 8 different cities over a 2-week-period, drawing a total crowd of nearly 200,000. Aalborg Carnival. (May) - Although the music not being the main attraction, this carnival is the biggest in Northern Europe and creates an atmosphere that would make any music festival proud. The Main Parade has a different theme each year, with more than 25,000 people dressing up and partying in the streets. Denmark is teeming with amusement parks, and indeed features some of the most famous in world; Copenhagen's Tivoli is one of the oldest of such parks in the world, and by Walt Disney's own admission a major source of inspiration for his own Disneyland. Also in Copenhagen, nestled among majestic beech trees Dyrehavsbakken is the worlds oldest operating amusement park, and both of these parks features some of the oldest still operating rollercoasters in the world dating back to 1914 and 1932 respectively, and both receiving the ACE Coaster Classic Award. Just as famous is Legoland in Billund, the largest and the oldest of the now global franchise, with its spectacular miniature LEGO sceneries the star attraction, and a good selection of thrill rides to entertain kids. While outshone by its world-famous rivals, there are four other major amusement parks in the country: Sommerland Sjælland, Bonbonland, Fårup Sommerland, Djurs Sommerland, and a host of smaller ones. With its large coastline, Denmark offers ample opportunity for coastal fishing - this, however requires a permit  that is available from the official web site or all post offices at a rate of 40 kr for a day, 130 kr for a week and 185 kr for a year. On the accompanying slip, however, you are immediately informed of the allowed seasons and allowed sizes of the most common species encountered on the Danish coastline. Sea Trout is common, as is Cod and Plait, and save for a few inland fjords, water quality and thus fish populations are reasonable. As for freshwater fishing, Denmark offers a diverse number of streams and brooks (no actual rivers, though), that host Salmon, Brown, Rainbow and Sea Trout (in the season), and Grayling, as well as Pike, Perch and Roach, as do a number of inland lakes which also host Zander, Bream and Tench. Freshwater fishing is a bit more complicated than coastal fishing in Denmark, however, as there is a host of local communities presiding over the rights to fish in the specific waters, usually in agreement with the land owners where the waters are situated if they are not owned by the state, but that also means that some stretches of a specific stream or brook may be off-limits, due to the land owner's ownership. Regulations for seasons and sizes are mandated by the state, but prices and terms for permits are regulated by the communities. Local tourist offices are usually well informed and mostly allowed to sell permits, which may be daily, weekly, monthly or yearly. Lastly, there are a significant number of "Put-and-Take" facilities across the country. They do not require a permit as such, as you purchase the right to fish for a number of hours and plenty of fish - usually Rainbow Trout - are guaranteed. Many put-and-takes are "self-serve" in the sense that you fill out a form and dump it, and the corresponding payment, in a post box. Do not be surprised if the proprietor comes by at some time to ask if you are in luck, at the same time keeping track of the number and times of the forms, hours and payments that he has collected from the box. A general hunting permit (500 kr) is required, but hunting is almost exclusively done with people that you know, and who have the hunting rights to the land in question. If you want to go hunting in Denmark, you would most probably need to befriend a landowner or a friend of one beforehand. Danish weapons legislation is extremely restrictive. Generally any type of weapon is illegal to own or carry anywhere. There are exceptions for hunting and weapons clubs, but this requires a special permit, and outside the shooting area (hunting grounds or club) the weapon must be concealed and not loaded. Many types of knives are also illegal. Weapon types which cannot be used for hunting or shooting contents - such as knuckles - are just outright illegal anytime and anywhere. The fine for carrying an illegal weapon, especially if it is ready to use, may be severe: A heavy fine and possibly some weeks in prison. A network of bikeroads has been established across the country. Denmark is a haven for cyclists, and where ever you go you will be met by people riding their bikes; young and old, thick and thin, for transport, fun or the sports of it. Denmark is one of the countries in the world where bikes are the most widely used. This also means that facilities for biking are good, making it more convenient and safe than many other places. But most importantly, the country is super flat and is perfect for biking around, being it in the city or the country side. Many Danes and tourists go on "biking holidays" to many of the popular, quiet spots around the country. So indulging in the culture is one of the best ways to connect with the Danish spirit as well as a great and easy way to explore pretty much every corner of the place. A good place to start is here. It is important however to understand that many rural roads are narrow, with occasional fast driving car traffic and without bike lanes, so biking in the countryside is not recommended in these places, unless you are a very skillful and aware biker. Surfing at Cold Hawaii on the North Sea coast. Water sports are popular. The large coastline makes Denmark an excellent place for surfing, especially wind- and kite-surfing. The North and West coasts hosts some of the best places to do so in the world, and the town on Klitmøller (named "Cold Hawaii") even hosts a leg of the windsurfing world cup each year . In many places it is easy to take classes for all levels of experience which makes for a lot of fun, and it is not even as cold as it may sound. In addition to the sea coasts, there are many inland rivers, creeks and lakes that make excellent opportunities for enjoying the waterways. Canoeing and Kayaking are popular activities and renting the equipment is usually a piece of cake. Along the popular rivers there are located camping spots, ranging from simple, free shelters to fully equipped, commercial sites, giving all kinds of opportunities from just a couple of hours of fun to a week of "water ways safari". Some of the popular spots for canoeing are the lakes and rivers around Silkeborg, Skjern Å National Park, Ribe creek, Uggerby creek in Northern Jutland, Mølle Å (Mill Creek) near Copenhagen, Suså in Southern Zealand. For sea kayaking, the Limfjorden sound is great (especially around the islands Fur and Mors), the islands south of Svendborg world class (Sydfynske Øhav, and also the channels of Copenhagen offer interesting opportunities. The national currency is the Danish krone (plural "kroner", abbreviated "kr" (ISO code: DKK). In the more "touristy" shops in Copenhagen, and at the traditional beach resorts along the Jutland West Coast and Bornholm Island it will often be possible to pay in euros. The Danish krone is pegged to the euro in a narrow band of plus or minus 2.25%. Kroner come in 50 øre (½ kroner) copper coins, 1, 2 and 5 kroner silver nickel coins with a hole in the centre, and finally solid 10 and 20 kroner bronze coins. Notes comes in nominations of 50 kr (purple), 100 kr (orange), 200 kr (green) 500 kr (blue) and 1000 kr (red). Since 1 January 2018 retailers in Denmark have legally had the option of not accepting cash payments from 20:00 to 06:00, to improve workplace security for employees. Automatic teller machines are widely available even in small towns, but some ATM's are closed during night time out of security reasons. The Danish word is Dankortautomat, hæveautomat or kontantautomat, and might be useful to remember as the term ATM is not universally known. Nearly all machines regardless of operator will accept the Danish Dankort, MasterCard, Maestro, Visa, Visa Electron, American Express, JCB and China UnionPay. While the majority of retailers accept International credit- and debit cards, there are a few that still only accept the local Dankort. Virtually everywhere you are required to use a PIN-code with your card, so if this is not common practice in your country, remember to request one from your bank before leaving home. Also beware that most retailers will add a 3%-4% transaction charge (often without warning) if you pay with a foreign credit card. A few machines will not accept PIN-codes longer than 4 characters, which can create problems for north-American or other European users. Ask the clerk operating the machine if it accepts 5-digit PIN-codes before attempting to operate the machine. Your card may be rejected even without entering the PIN if it is incompatible. Almost everything in Denmark is expensive, though in general prices are still somewhat cheaper than in Norway. All consumer sales include a 25% sales tax (Moms) but displayed prices are legally required to include this, so they are always exact. If you are from outside the EU/Scandinavia you can have some of your sales tax refunded  when leaving the country. The average price of hotel accommodation was around 900 kr according to the annual 2009 Hotels.com price index. A hostel bed hovers around kr 200 kr, but can be found cheaper in Copenhagen. While a three course meal at a standard restaurant will usually set you back around 200-300 kr, this can be done cheaper if you eat in cafés or pizza joints, 50-100 kr. Sundries like a 1½l bottle of Coca-Cola costs 10-15 kr in discount stores, while a beer will cost you 3-20 kr in a supermarket, and 20-60 kr in bars. If you are a bit careful about your expenses, a daily budget of around 700 kr per day is not unrealistic. The public space however offers quite a few freely accessible options for leisure activities, mainly in the larger cities. This includes streetsport spots, city bikes, playgrounds, churces, many museums and all parks, beaches and nature sites. In the nightlife, most bars and popular spots has free entry to. Locals who live near the border often drive into Germany to purchase groceries, as the prices are significantly cheaper, so you should consider this option as there are no permanent border controls between Denmark and Germany. Traditionally, tipping has not been common, but is being introduced by outside influences. Since service charges are automatically included in the bill at restaurants and hotels, and tips for taxi drivers and the like are included in the fare, tipping should be given only as a token of real appreciation for the service. The tips will most often be split between the waiters and the kitchen. Taxi drivers do not expect tips, any extra service (such as carrying bags) will be listed on the receipt according to rate. While tipping is not expected, nor required, tipping for outstanding service is obviously greatly appreciated. Pickled herring, (da: Sildemad) plain, curry, or with red spices. Liver Paté Sandwich (da: Leverpostejmad), probably the most popular. Stjerneskud, white bread, salad, one fried and one steamed plaice fillet, shrimp and mayonnaise. Pariserbøf, white bread, beef patty fried rare and topped with capers, horseradish, raw onions, and a raw egg yolk. Flæskesteg. Slices of pork roast with pickled red cabbage. Kartoffel. Boiled, sliced potatoes with tomatoes, crispy fried onions, and mayonnaise. Makrel i tomat , mackerel in tomato sauce topped with mayonnaise, raw onion and black pepper. Torskerogn . Slices of boiled cods roe. Served in a variety of ways, but a salad leaf, Danish remoulade and raw onion is a classic. Shrimps, (da: Rejer) you often get a generous portion of just shrimp with a little mayonnaise and a slice of lemon. White bread. Cheese, (da: Ost). Try a very old cheese served with raw onions, egg yolks and rum. Apart from the ubiquitous kebab shops and pizza stands, dining in Denmark can be fairly expensive, but a worthwhile cost. As a family with kids, you can dine at nearly any restaurant in Denmark, as long as your kids are able to behave themselves. Many restaurants have a special child's menu option (børnemenu in Danish) at a cheaper price. In the new millennium, Copenhagen has emerged on the world scene as a very happening place for food enthusiasts and gastronomic travellers, the highlight being the world-renowned restaurant Noma serving and evolving the New Nordic Cuisine, but many restaurants with an international gourmet cuisine has also been celebrated and are attracting attention internationally. Copenhagen is not the only place with high end restaurants worth a visit and international gastronomic guides have broadened their discerning gaze to include several places outside the capital in the last few years. Three restaurants in Aarhus has received Michelin stars since 2015 and many places in the province are featured in food guides. If you are looking for gastronomic experiences out of the ordinary in Denmark, it could be a good idea to study The White Guide a bit. It is not a complete guide, but it claims to be the only authoritative restaurant guide for the Nordic region and started out in Sweden. There are both an international version in English and a Danish version; the Danish version has the most detailed information, although many high quality places haven't been covered at all. Restaurants and eateries serving traditional Danish meals have also been on the rise throughout the country and they are popular with both Danes and tourists alike. In most major cities, restaurants offering an international cuisine are common, as are restaurants of other cultural flavours, especially Mediterranean and Asian. Speciality places such as Japanese, Indian, Caribian or Mexican restaurants can be found too. The food quality is generally high, with a strictly enforced nationwide quality control system. Every employee that prepares food needs a hygiene certificate and the competition is usually too sharp for most low-quality businesses to survive. If these facts doesn't make you feel safe, popularity among locals is usually an indicator of quality as in most other countries. Organic produce and environmental awareness is very high on the agenda in Denmark and everywhere you go, restaurants and eateries advertise with organic food. There is a nationwide system with bronze, silver and gold signs, signalling how large a percentage of the food is organic. Organic is called "Økologisk" in Danish and the letter "Ø" (often in red) marks organic produce in general. Cooked ham with stewed kale and caramelized potatoes. Traditional Danish food are often hearty meals and pairs well with beer. Traditional Danish fare includes the ubiquitous smørrebrød and several hearty hot meals such as frikadeller (pan fried meat balls served in various ways), stegt flæsk (fried slices of pork belly with potatoes and parsley white sauce), flæskesteg (roast pork with cracklings served with red cabbage, potatoes and brown sauce), æggekage (large omelette with fried pork, mustard and rye bread), hakkebøf (chopped steak served with soft onions, potatoes, pickles and brown sauce), biksemad (hash with potatoes, meat, onions and fried egg), Tarteletter (small puff pastry shells filled with warm stew of either chicken or shrimps with asparagus, served as an appetiser), tenderloin with creamy mushrooms or wienerschnitzel with hash and green peas. The traditional Danish cuisine goes particularly well with beer. Shots of aquavit or snaps are also traditionally enjoyed, but mainly on special occasions or when guests are over. Historically, finer Danish cuisine has been influenced by French cuisine and includes various soups, roasts (duck, beef, veal and pork) and mousses (called fromage in Denmark). Roasts are typically served with potatoes, blanched vegetables, pickled berries and brown sauce or glace. Fine traditional Danish cuisine is to be enjoyed with wine. Drinking along with meals is encouraged as the foods are enhanced by the drinks, and vice versa. The traditional bread in Denmark is Rugbrød, a special kind of dark and dense sourdough, wholemeal rye bread, and it is still a popular choice, especially for smørrebrød. Common white bread, locally known as franskbrød (French Bread), is equally popular and available everywhere. Rundstykker is a special kind of crusty white bread wheat buns usually served for breakfast, in particular on special occasions or Sunday mornings. There are several kinds, but all are light in texture and the most popular are håndværker with a generous sprinkle of poppy seeds. You can buy rundstykker at every bakery and most places serve them with a spread of butter if you ask. They are eaten just like that or with cheese, cold cuts or jams of your choice. Special cakes are made around Christmas and Carnival. Special Christmas cakes includes julekage (a large Danish pastry with marzipan, Corinthian raisins, succade and nuts), pebernødder (small peppery cookies, traditionally used for a number of games) and klejner (deep fried rhombus shaped dough, flavoured with cardamom and lemon zest and only slightly sweet) and for Carnival in February it includes a variety of fastelavnsboller (Carnival-buns), which usually comprise pastry creme filled buns with icing and flaky pastry cakes filled with a whipped cream mix and redcurrant jelly. The menus change around the feasts of Christmas and Easter, and on Mortensaften (St. Martins Day), roast duck is the food of choice. Without going into intricate details about Christmas and Easter menus here, æbleskiver, gløgg, ris á la mande and brændte mandler are common sweet treats to be had in December. Æbleskiver are fried balls of puffy dough (similar in texture to American pancakes), served with jam and powdered sugar. Gløgg is a mulled wine of various recipes that is enjoyed hot (by adults) on its own or accompanying æbleskiver or Christmas cookies. Ris-á-la-mande is a sweet rice pudding with whipped cream, vanilla and chopped almonds, served cold with cherry sauce and brændte mandler (burnt almonds) are caramelized almonds, typically roasted in large open cauldrons and sold in the streets. The traditional Danish lunch is smørrebrød (open sandwiches usually on rye bread) with a large variety of toppings ranging from pickled herring, fried plaice, and shrimp to cold meat cuts, pâtés, various salads or cheeses. Shellfish is served on white bread, and many restaurants give you a choice of breads. Smørrebrød served on special occasions, in lunch restaurants, or bought in lunch takeaway stores, are piled higher and more luxurious than the daily fare. The Danish rye bread (rugbrød) is dark, slightly sourish and often wholegrain. It is a must for all visitors to try. No visit to Denmark would be complete without patronizing a Pølsevogn (lit. : Sausage-wagon). These are street vendors selling a variety of sausages (pork) and hotdogs. Some larger places also have burgers and other fast food items for sale. If looking for a quick snack to grab on the go, try a Danish hot dog, served in a bun with a variety of fixings. The best way to try a Danish hot dog is to get a "ristet hotdog med det hele"; a hot dog with a grilled sausage and the works, comprising ketchup, strong mustard, Danish remoulade (a Danish take on the French remoulade sauce, consisting of mayonnaise with the addition of chopped pickles and turmeric for color), fried and raw onions, finished off with pickled cucumbers on top. It's messy, it's unhealthy, and it's really good! If you are into it, you should buy a warmed Cocio chocolate milk on the side, the traditional accompanying beverage. Most places also sell red coloured boiled sausages, a Danish specialty. They are funny to look at, but some of the other sausages for sale are more flavourful. Esrom cheese. Denmark produce some excellent cheese and dairy products. Denmark produces some of the best dairy products in the world. The production is well-organized and the hygiene, educational and technical level is as good as it gets. For a country the size of Denmark, the variety is outstanding with both large scale industrial producers (primarily Arla) and small local dairies but also different cow breeds and conventional, organic and biodynamic production; all available across the country in most larger stores. As Danish specialties, ymer is a fermented dairy product, somewhat similar to yogurt, and koldskål is a sweetened dairy beverage (or dessert) of various flavours on sale in spring and summer. Perhaps most interesting to travellers, Denmark produces some marvellous cheeses. Several of them are local delicacies, such as rygeost, Danablue, pungent aged semi-soft cheeses (Gammel Ole and others) or Vesterhavsost, a semi-hard cheese matured in caves in western Jutland. You can buy them in shops, delicatessen or enjoy them at many restaurants. The Arla company has launched a series of top-notch dairy products, and most of all cheeses, under the brandname of Unika, available in Unika shops in Copenhagen and Aarhus. Some restaurants and a few supermarkets also sells the Unika dairy products. Jomfruhummer (langoustine), a local delicacy of Læsø. Smoked herring with rugbrød, egg yolk, onions and chives, a local delicacy of Bornholm. Sheep herd in the Wadden sea National Park. The climate in Denmark is excellent for fruit and berry production and several companies produce great jams and fruit juices. Den Gamle Fabrik (The Old Factory) is by far the largest producer of jam and is a well-known exporter. Their jams has a high fruit content and are produced without boiling, preserving the taste, nutritional value and consistency better than other products. There is a very large variety available from this company alone, some without added sugar. Try the solbær (black currant), jordbær (strawberry), rabarber (rhubarb) or hyben (rosehip) for example. The taste is rich, complex and just outstanding. For juices, try to avoid the usual juice from concentrates and go for the more expensive cold-pressed unfiltered juices. Denmark has many varieties of apples, some older varieties have been almost forgotten for many years, but are now brought back to the attention of general consumers. Ingrid Marie, Gråsten, Filippa and Ærøæble are just a few fame-claiming apples of Danish origin out of more than 300. Dansk Landbrugsmuseum (Danish Agricultural Museum) at the manor of Gammel Estrup between Aarhus and Randers in Jutland, grows a total of 281 Danish apple varieties in their groves. Apples are collected here every year on the 4th of October and can be bought and tried on site or in Viborg and Høje-Taastrup outside Copenhagen. The open-air museum of Frilandsmuseet in Lyngby, a northern district of Copenhagen, also grows and preserves many old Danish varieties of apples, fruits and berries, almost all unknown to industrial production. Denmark has also been known as a cherry liquor exporter for more than a century (the Heering brand is perhaps the best known abroad), but in the course of the last couple of decades the Frederiksdal estate on Lolland has developed high-end luxury cherry wines to international appraisal and prize winning. For a tiny country like Denmark, there are a large amount of regional and local delicacies to try out. Special lamb on the meadows of the Wadden sea area in the south-west, mussels at the Limfjord, fresh catches from the North Sea in north-west Jutland in particular, heathland honey in central and west Jutland, langoustine on the island of Læsø, smoked fish and various herring dishes on the island of Bornholm, and others. Apart from the locally tied produce, the regions of Denmark also present some individual culinary traditions. A selection of cream cakes in a Konditori. The "Eat" section would not be complete without a few words on the "Danish" in Denmark. No, we are not talking about the people, but of course the delicious pastries known as Danish, so famous all over the world for their crispy sweet delight. In Denmark, Danish is actually known as Wienerbrød (Bread from Vienna) for historical reasons, but if you ask for "a piece of Danish" most people would understand what you crave anyway, so don't be shy of asking. There are many types of Wienerbrød in Denmark; the well-known round pastry with icing is just one of many many kinds, and it is of a quality that is rare to find elsewhere. All bakers sell Danish pastries of some kind, but certain bakers have a very large variety. There are custard-filled Danish pastries, some with jam of prunes or raspberry, some are a metre long, covered in slivered nuts, raisins and filled with marzipan, while others are the size of large dinner plates, flavoured with cardamom or cinnamon, intended for sharing with good friends and a cup of coffee or tea. The world of Danish baking does not end with Danish pastry and many cakes here are unique to the country, like the marzipan and chocolate filled strawberry tarts on sale in the summer months or the elaborate and sophisticated cream cakes served cold. Many larger bakeries have a café section of their own, where you can enjoy your cake, while dreaming of the next one, but there is a long tradition also for Konditorier, the Danish take on the French Patisserie. These are clearly for the advanced cake lover, and can be found in most larger cities. La Glace in Copenhagen is perhaps the most famous, serving exquisite cakes since 1870. Sweets of a large variety are available everywhere in Denmark and all larger towns has one or several slikbutik (candy store). Denmark is known internationally for its high quality marzipan and chocolate and perhaps the largest and best known exporter is the Anton Berg company. A few select stores has specialized in chocolate and marzipan only and offers a huge variety of homemade treats; some flavoured with orange peel, some filled with brandy and others are mixed with nuts or Danish nougat. Flødeboller are a chocolate covered meringue specialty invented in Denmark in the 1800s, and are widely available. They are now enjoyed all over the world, but some candy stores in Denmark offers high quality homemade flødeboller of various kinds and they can be recommended. Bolsjer (drops) is a common traditional candy in Denmark, cooked and enjoyed for centuries, and there are now a very large variety available. A few historical drop-boilers (Danish: Bolsjekogeri) still exists and can be experienced all across the country as living museums where you can watch or participate in the art of cooking drops. Historical drop-boilers in Copenhagen include Sømods Bolcher in the inner city and Tivoli also has a drop-boiler. You can buy drops of various kinds in nearly any store. Liquorice is another type of candy that has a long history in Danish culture and is very popular. Formerly also used as medicine, liquorice candy is now available in many varieties, both mild and very strong, but liquorice with salt or salmiakki seems to be particularly favoured by the locals. It is perhaps an acquired taste, and many visitors are often amazed how anyone can find it enjoyable. Try a Super Piratos or some Salt-lakrids if you dare and make up your own mind. Liquorice ice cream is also common at ice cream stands and as industrial produced popsicles. Production of high quality liquorice has resurfaced in Denmark, in particular on the island of Bornholm, and has even found ways in to new experimental cooking. Candy and sweets of more modern origin can be found in packets at almost any store, but if you want to have a glimpse of the variety and creativity of Danish candies, pay a visit to a candy store slikbutik. Here you can pick and mix a bag of candy just how you like it and some larger stores has more than a hundred different kinds, ranging from gummies, liquorice, chocolate, marshmallows, bolsjer to nougat, chewing gums, caramels and various confectionary treats. Many Danes are often perceived as being closed and tight lipped, bordering the outright rude. So while it is by no means impossible, you can be hard pressed to find a Dane readily engaging in casual conversations with strangers. That is, until you hit the country's bars and nightclubs. The ubiquitous Carlsberg is a well-known Danish beer brand worldwide and can be had almost anywhere in Denmark, but more than a hundred Danish micro breweries also provides excellent quality beers across the country. As any foreigner who has spent time observing the Danes will tell you, alcohol is the fabric that holds Danish society together. And when they are off their face in the dead of night, many suddenly let their guard down, loosen up, and while a bit pitiful, somehow transmorph into one of the most likeable bunch of people on Earth. Rather than the violence associated with binge drinking elsewhere, because it seems to serve a very important social purpose, the natives get very open, friendly and loving instead. It takes some time getting used to, but if you want to form bonds with the Danes, this is how you do it - God help you if you are abstinent. This also means Danes have a very high tolerance for drunk behaviour, provided it takes place in the weekends. Drink a glass or two of wine for dinner during the week, and you can be mistaken for an alcoholic, but down 20 pints on a Saturday night, and puke all over the place, and everything will be in order. There is no legal drinking age in Denmark, although a legal purchase age of 16 is in effect in shops and supermarkets when under 16,5% alcohol, and 18 in bars, discos, restaurants and shops and supermarkets when over 16.5% alcohol. The enforcement of this limitation is somewhat lax in shops and supermarkets, but quite strict in bars and discos, as fines of up to 10,000 kr and annulment of the license can incur on the vendor. The purchaser is never punished, although some discos enforce a voluntary zero-tolerance policy on underage drinking, where you can get kicked out if caught with no ID and an alcoholic beverage in your hand. Some would claim that the famous Danish tolerance towards underage drinking is waning in light of health campaigns targeting the consumption of alcoholic beverages among Danes. As adult Danes do not approve of the government interfering with their own drinking habits, the blame is shifted towards adolescents instead, and proposals of increasing the legal purchase age to 18 overall have been drafted, but have yet to pass Parliament, neither is it likely to in the foreseeable future. Drinking alcoholic beverages in public, is mostly considered socially acceptable in Denmark. Having a beer in a public square is a common warm weather activity, though local by-laws are increasingly curbing this liberty, as loitering alcoholics are regarded as bad for business. Drinking bans are usually signposted, but not universally obeyed nor enforced. In any case, be sure to moderate your public drinking, especially during the daytime. Extreme loudness may in the worst case land you a few hours in jail for public rowdiness (no record will be kept, though). Most police officers will instead ask you to leave and go home, though. Danish beer is a treat for a beer enthusiast. The largest brewery, Carlsberg (which also owns the Tuborg brand), offers a few choices but is mostly limited to lager beer (pilsner), which are good, but not very diverse. A large number of micro breweries, however, offers a broad selection of beers well worth trying from IPA to porter, stout and weissbier and anything in-between. Special spicey "Christmas beers" are produced in the 6 weeks leading up to the holidays and strong "Easter brews" are on offer in the early spring. Other tasty beverages include the Aquavit (Snaps) and Gløgg - a hot and sweet wine drink popular in December. "Limfjords-porter", a strong Danish porter from the Limfjord area. Local craft beers are commonly available across the country. Thisted Bryghus, a brewery in Thisted, North Jutland founded in 1902. The production includes a range of organic beers. Fur brewery. Situated on the island of Fur in the Limfjord, North Jutland. Fuglsang, brewery based in Haderslev, South Jutland since 1865. Hancock, based in Skive, North Jutland since 1876. Bryggeriet Refsvindinge, a brewery on Funen near Nyborg, founded in 1885. The brewery has a bed & breakfast. Skovlyst. A brewery and restaurant in a forest just west of Copenhagen. Available in shops all over the country. Vesterbro Bryghus. Microbrewery and restaurant in the Copenhagen neighbourhood of Vesterbro. Mikeller. Relatively new high-end Copenhagen-based brewery with Mikeller bars in Copenhagen and Aarhus of uncompromising quality. Mikkeller has bars around the globe, from Taipei to San Francisco. Aarhus Bryghus. Micro-brewery in Aarhus with a large and changing selection. Usually large 0.6 litre bottles. "Gammel Dansk" (Old Danish), a commonly available Danish Aquavit. The gastronomical underground scene is stirring and bubbling in Denmark and it also includes distilleries and breweries of all kinds. Small quality micro breweries and distilleries can be found throughout the country and comprise craft beers, whiskeys, aquavit, gin, wines and liqueurs. Almost all of them are relatively new, from the early 2000s, but several has already received enthusiastic appraisals by connoisseurs and won awards for their unique products. They aren't called micro breweries for nothing; the productions are usually rather limited, with beer taking the larger share generally, and the products can usually only be found at the breweries themselves, a few select bars and restaurants or in speciality shops in big cities. Historically, the excellent fruits and berries produced in the Danish climate has been used to make several fruit wines and liqueurs, in particular local varieties of cherries, apples and black currants. Modern distillers and entrepreneurs has been inspired by these traditional practices and use of local ingredients, enhancing and developing production methods to make exquisite luxury products. Denmark has been a well-known exporter of cherry liqueur for more than a century, in particular to Sweden, England and Holland. The Heering brand from 1818 is perhaps the best known worldwide as it went famous in 1915 when bartender Ngiam Tong Boon in Raffles Hotel, Singapore used it to make the first Singapore Sling cocktail. Cherry Heering can still be had in Denmark and around the world, but newer small Danish winemakers has out-competed it, in terms of quality. This includes Nyholmgaard Vin on Funen, Cold Hand Brewery near Randers in East Jutland and RÖS cherry liqueur from Dyrehøj Vingaard near Kalundborg on Zealand. Solbærrom (black currant rum) is another traditional Danish sweet fruit liqueur, even though it is based on imported rum from the Caribbean. It used to be much more popular in previous times, with several producers, but nowadays only Oskar Davidsen delivers with an unchanged recipe since 1888. The black currants gives this liqueur type a rich, sweet almost creamy fruit flavour, but also tannins and a certain character that the rum further enhances. Other Danish liqueurs are based on apples and new distilleries have launched prize winning strawberry and elderberry liqueurs as part of the gastronomical wave of New Nordic innovations. Frederiksdal estate on Lolland has developed high-end luxury cherry wines in the last one or two decades, receiving several appraisals and prizes internationally. Frederiksdal wines are rich, complex and with several variations depending on the cherry type and production methods, but they are not sweet (or cheap) as the cherry liqueurs. You can buy Federiksdal cherry wines at specialty shops across the country, some restaurants serves them to be enjoyed alone or with desserts or why not visit the estate yourself, while you are in Denmark? Guided tours with tastings are arranged regularly. There is a long tradition of home productions of fruit wines based on apples and other local fruits and berries, but such wines are hardly available in the market. Mead is a honey-based wine that used to be much more prominent in Danish and Nordic culture and is in particular associated with the Vikings. This alcoholic beverage has also seen a cultural revival, but since the main ingredient is honey, it is a bit expensive and can mostly be found in specialty shops. Mead taste like nothing else and is worth a try. Wine based on grapes have been enjoyed in Denmark for millennia, but the climate has not allowed for grape growing here since the Bronze Ages, so wine was exclusively an imported luxury, until recently. With the current climate changes, globally and locally, Denmark is becoming increasingly suitable for domestic wine production and foresighting entrepreneurs and enthusiasts has initiated local productions on a small scale. Perhaps a local curiosity more than a treat for wine connoisseurs? Try for yourself and be your own judge. Dyrehøj Vingaard near Kalundborg on Zealand is the largest wine farm in Denmark and produces wine, brandy (edelbrand), gin, cider and liqueurs, including cherry and apple liqueurs. All their products are marketed under the brand RÖS, referring to the Røsnæs peninsula where the farm and winery is located. Skærsøgård north of Kolding in Jutland was the first authorized winefarm in Denmark and produces all kinds of wine, including fruit wines, and liqueurs since 2001. You can visit the farm the first Wednesday (15:00-17:00) of the month. Nordlund (Dansk Vincenter). You don't have to leave the city to visit a Danish winefarm. Nordlund in Hvidovre, a suburb east of Copenhagen, welcomes visitors year round on Thursdays (13-17 hours). Winetastings and arrangements can be negotiated. "Bjesk", an Aquavit specialty of North Jutland flavoured with a variety of local herbs. Aquavit, also known as snaps or brændevin (burning-wine) in Danish, has been popular in Scandinavia for centuries and in Denmark it is still to be found anywhere you look. Made from potatoes and sometimes various grains, pure distilled aquavit is clear and without taste, but an endless variety of herbs are used as additions for flavour and colour. Caraway, dill and sweetgale are common herbal infusions but many locally tied variations exists and are worth trying. One or two shots of aquavit is to be enjoyed on festive occasions such as the traditional dinner-party arrangement of Det Kolde Bord (The Cold Table), comprising a selection of cold dishes, including smørrebrød. Aquavit is also used to mix some local drinks; added to a cup of coffee to make a kaffepunch or mixed with lemon soda to make a flyver (airplane) are well known drinks. At 45-50% alcohol, aquavit should be approached with caution and it is not an everyday beverage nowadays. Quality gin is increasingly popular and available. Njord is a micro distillery in central Jutland producing high quality gins. Whiskey has been enjoyed for many years in Denmark and in the 2000s, local distilleries have launched high-end whiskeys of various kinds. Braunstein in Køge south of Copenhagen has produced Danish whiskey since 2005. They also make aquavit and vodka and has a sizeable craft beer production that can be had across the country. Fary Lochan in Give, central Jutland, is one of the smallest distilleries in the world, but has a varied production nevertheless. The name is Scottish and is meant as a homage to the Scottish culture of whiskey making, as single malt whiskeys has the primary focus here. Various aquavit's flavoured with local ingredients are also produced, a specialty gin and some experimentation with wines as well. A much appraised specialty from Fary Lochan is their sweet and celebrated strawberry liqueur. For Budget accommodation, Danhostel is the national accredited Hostelling International network, and operate 95 hotels throughout the country. Only the country's two largest cities - Copenhagen and Aarhus, have a few independent youth hostels. It is worth noting that the Danish word for hostel is Vandrehjem, which also what hostels in Denmark are usually signposted as. Another option is one of the Hospitality exchange networks, which is enjoying growing popularity among the Danes, with couchsurfing reporting a doubling of available hosts every year. Hotels are expensive in Denmark, with an average price of a double room hovering around 847 kr in 2007, hotels are mostly off limits to shoestring travellers, although cheaper deals can most certainly be found, especially for online bookings done in good time before arriving. National budget hotel chains include Zleep and Cab-inn. Alternatives to hotels include a well developed network of Bed & Breakfasts which are bookable through the national tourism organization VisitDenmark (Click on Accommodation > Private accommodation) - or in country famous for its bacon, butter and cheese - what better way to dive into Danish culture than on a Farm Holiday? the National organization maintains an online catalogue of farms offering stays all over the country in both English and German. Another alternative to hotels are the many historic Old inn's - or Kro in Danish - dotting the towns and villages, most of them are organized though a national organization called Danske Kroer og Hoteller. Another overnight is in one of the more than 500 caravan sites (campingpladser in Danish). Most of them are well equipped with up-to-date facilities, and even Wi-Fi included in many cases and accepts both caravans, motor homes and tents and/or rent out cabins. The association Danish Camping Board maintains a list of 450 approved campsites on their website (danishcampsites.dk) and Eurocampings has almost 350 on their site (eurocampings.co.uk). Prices varies greatly and can be anything between €40 and €200/night for a family with a caravan. You prefer to sleep in closer contact with nature? The article Primitive camping in Denmark provides additional information on sleeping in tents, bivouacs, shelters and similar. Dial 1-1-2 (Alarm 112) in an emergency for emergency services in case of accidents, serious crime and fire — situations that are dangerous for life, health, property or the environment. This is toll free, and will work even from cell phones without a SIM card. For the police in non-emergencies call 1-1-4 (Service 114). Generally: Denmark is a very safe country, with almost no risk of natural disasters or animal attacks. There is one poisonous, but rare and non-aggressive, snake (the European viper or Hugormin Danish) in some heathlands, and a stinging, bottom dwelling fish called "Fjæsing", known as Greater Weever (Trachinus draco) in English. Its sting is painful, but not generally lethal. It is strong enough however to be lethal to children and the elderly, so medical treatment is always encouraged. Red stinging jellyfish sometimes infest bathing waters in great numbers. Their sting can be painful, but has no adverse effects on humans. They are dish-sized, easy to spot and avoid. As in the rest of Europe and the world at large, borrelia carrying ticks have also been on the rise in Denmark. Always check your body for attaching ticks, when you have been in the wild, especially when legs and arms are bare and the vegetation high. If they are removed quickly, no disease will be transmitted. If infection does occur, a red ring will occur around the bite, and you should seek medical assistance as soon as possible. Since 1 August 2018 it has been prohibited by law to wear garments that hides the human face in public, unless there is a creditable purpose – officially called tildækningsforbud (coverban), also known as maskeringsforbud (maskingban) and burkaforbud (burqaban). A fine of 1,000 kr is given at the first violation, 2,000 kr for the second violation, 5,000 kr for the third violation and 10,000 kr for the fourth violation. The police has issued a set of guidelines that gives an assessment of what can be considered a creditable purpose. Wearing a burqa, niqab or balaclava in public is not considered a creditable purpose according to the guidelines. Compared to most other countries, crime and traffic are only minor risks, and the most serious crime visitors are likely to encounter is non-violent pickpocketing. On foot: In cities Danes drive by the rules, and they have every expectation that pedestrians do the same. Therefore, it is important to obey Walk/Do not Walk signals and avoid jaywalking in cities, simply because cars will not slow down since you are not supposed to be there. Traffic signals are obeyed around the clock, so do not get surprised to see law-abiding Danes, in the dead of night with not a single vehicle or bicycle in sight, patiently waiting for green light. You are supposed to do the same. Also, take good notice of the dedicated bike lanes when crossing any street to avoid dangerous situations as bikers tend to ride fast and have right of way on these lanes. On the beach: Do not bathe alone. Do not get too far away from land. Swim along the coast rather than away from it. In some areas undertow is a danger, and kills a number of tourists every year, but will mostly be signed at the beach. On many beaches, flags indicate water quality. A blue flag means excellent water quality, green flag means good water quality, red flag means that bathing is not advised. A sign with the text "Badning forbudt" means that bathing is forbidden. Obey these signs, as it often means that the water is polluted with poisonous algae, bacteria, or chemicals, or that there is a dangerous undertow. Beaches on small islands are often prone to tidal waters, especially in the Wadden Sea. In the city: A few districts in major cities are probably best avoided at night by the unwary, or by lone women - but unlike in North America, it is often the suburban projects that are unsafe, not the downtown areas. Tourists will rarely pass through these outskirt areas by chance, but exchange students occasionally end up in apartments here without being aware of these districts reputation beforehand. Tap water is potable unless indicated, which is very rare indeed. The regulations for tap water in Denmark even exceeds that of bottled water in general, so do not be offended if you notice a waiter filling a pitcher of water at the sink, its perfect for drinking. However, most places charges a fee for the service. Restaurants and other places selling food are checked regularly by health inspectors and awarded points on a 1-4 "smiley scale". The ratings must be prominently displayed, so look out for the happy face when in doubt. Every cook or employee handling prepared food are required to hold a hygiene certificate and food poisoning is not a problem to be concerned with. Nearly all beaches are fine for bathing on sunny days - even parts of the Copenhagen harbour have been opened for bathing (read the Stay safe section). At quite a few beaches though, rainwater run-off from residential areas pours directly and untreated into the sea and flooding sewers are an increasing issue after heavy rain. During this time, bathing is not recommended at these places. Several municipalities issue bathing water quality data continuously on-line, so check up if you are going to bath after heavy rains. Winter bathing in the sea has become quite popular, but be careful, it requires a steady dedication for months to train your body for this endeavour. Jumping straight into ice-cold sea water without any preparation might make you sick. Since 2007 it has been illegal to smoke in any indoor public space in Denmark. This includes government buildings with public access (hospitals, universities, etc. ), all restaurants and bars larger than 40m² and all public transport. It is also prohibited to smoke on any train and bus platform outdoors. You have to be at least 18 years old to buy tobacco products in Denmark. It is generally not considered impolite to omit verbal formalities common in other cultures, such as generic compliments or courteous bromides. Likewise, Danes almost never use Sir or Madam to address each other, as it is perceived as distancing oneself. On the contrary, addressing (even a stranger) by first name is considered a friendly gesture. The only exception to this is when addressing Danish royalty – Queen Margrethe, her sons and their wives. Staff, waiters and every other employee is empowered in Denmark, so do not expect anybody to dance to your tune, even in expensive restaurants. Politeness goes both ways and acting like you have special privileges will be frowned upon. Rude or lacking service for no reason does happen occasionally and should not be tolerated, but handle the situation with a bit of diplomacy and treat your fellow man like an equal, or you will get nowhere. Be punctual, few things can make the Danes more annoyed than showing up later, even by minutes, than the agreed time, save social gatherings at people's homes, where the requirement for punctuality is more relaxed. If there are free seats on a bus or train, it's not customary to seat yourself next to strangers if you can avoid it. It is also a nice gesture to offer your seat for the elderly and the disabled. In many buses, the front seats are usually reserved for them. Be aware that there are marked "quiet zones" on each train: one in the back of the back wagon and one in the front of the front wagon. Don't talk on the phone there. In fact, do not talk at all. These are for people who want a quiet trip, usually people who need to go far, and may want to sleep, read, or work on their laptop or other things in peace. Danes try to abridge differences between social classes. Modesty is a virtue - bragging, or showing off wealth, is considered rude, as is loud and passionate behaviour. Economic matters are private - don't ask Danes questions like how much they earn or what their car costs. As in Germany, Britain, and the rest of the Nordic countries, weather is a safe conversation topic. When invited by a Dane - to visit their home, join them at their table or engage in an activity - do not hesitate to accept the invitation. Danes generally do not invite out of politeness, they only say it if they mean it. The same goes for compliments. Bring a small gift; chocolate, flowers or wine are the most common, and remember despite their disregard for formality, to practice good table manners while at restaurants or in people's homes. Even though 82% of the population is officially Lutheran, Denmark is by and large a non-religious country. Investigations into people's faith are largely unwelcome, and outside places of worship, displays of your faith should be kept private. Saying grace for example, is likely to be met with bewilderment and silence. Religious attire such as Muslim headscarves, kippahs or even T-shirts with religious slogans, will - while tolerated - also make many Danes feel uncomfortable. In Denmark, family nearly without exception takes priority over work. So do not be surprised if Danes excuse themselves from even the most important of meetings by four o'clock to pick up kids, a burden equally shared between the sexes. Possession of any amount of cannabis or other drugs is a crime. While Denmark does have a narcotic subculture in places such as the Christiania district, many Danish people shun narcotics. While Internet cafés are present in most larger cities, they are usually not geared for tourists and hence they can be a bit tricky to find. Hotels usually provide both wireless internet and computers with internet access, but whether this service is provided for free, varies greatly. Many cafés and bars also provide free wireless internet for paying customers, even when it is not signposted, so it is always a good idea to ask. A lot of the McDonalds restaurants in Denmark have a couple of internet terminals available for their customers. The easiest way to get online is often the public library, as there is one in almost every town. Public libraries are usually centrally located, well signposted (look for Bibliotek) and always free. There can be a bit of waiting time to get a free computer though, but there will normally also be some sort of reservation system in place. If staying for more than a few weeks, it might be worthwhile to get a mobile broadband connection. Most of the country has excellent coverage and speeds rivalling those of a fixed connection in the major cities and plenty for surfing the web, even in many of the more remote areas. Unfortunately the Danish ISPs generally do not have up to date English versions of their websites, so getting information about coverage and store location can be tricky. To buy a subscription package it is usually needed to have a residence permit, a Danish citizen id number (CPR-nummer or person-nummer) and a local address. This means, that in practice, subscription packages are only relevant to travellers staying for more than half a year in Denmark. The Telia and TDC packages can be bought in their stores located in the largest towns. Owners of modems, phones or tablets that support UMTS/HSPA+/LTE will most likely be able to use them, but otherwise a modem can be bought for about 400 kr. The Oister packages are available at many electronics stores and at any postal office. When travelling in both Denmark and Sweden it may be beneficial to get a prepaid package from the provider 3. 3 is present in Denmark and Sweden, but don't sell any prepaid products from their Danish stores. On the other hand, their stores in Sweden sells a prepaid package that works in both Sweden and Denmark with no added roaming charges. It might be possible to refill this product over the internet connection from Denmark with an international credit card, but the safest solution might be to stock up on refill vouchers before leaving Sweden for Denmark, since vouchers are not sold in Denmark. Abonnementpriser.dk - collects prices from many types of subscriptions, including TV, mobile broadband and more. Bring your own unlocked GSM phone to make calls. Prepaid SIM cards are available at most shops and international calling can be reasonably priced. Any prepaid credit is generally only valid for calls made in Denmark, but can be purchased in small amounts to avoid waste when you leave. Denmark's international phone country code is 45. The prefix for international dialling is "00" or '+' (on a mobile phone). The postal service in Denmark is run by PostNord. Postal franchises (posthus) sells postage stamps and can be found in many supermarkets and grocery stores all over the country. Business drop-in's (erhversindlevering) does not sell postage stamps. Post boxes are red with the postal logo, and most of them are emptied once every workday, a few of them even Saturdays, Sundays and holidays. It is not indicated exactly at what time during the day the mailboxes are emptied. An unregistered priority (airmail) postcard or letter with a weight of less than 100 grams is 30 kr (€4) for all international destinations (as of 1 January 2019). In case you insist on sending mail and find these prices a bit too steep; in some countries you may, before leaving home, purchase International Reply Coupons (IRS's) at the post office, and most likely save a good sum of money. An IRC is exchangeable in all UPU member countries for the minimum postage of a priority item or an unregistered airmail letter sent to a foreign country. When picking up the mail, you will need to identify yourself with a government-issued photo-ID (i.e. passport or driver's license). Make sure that your name is spelled in the same way on the package and on the ID. Nearly all developed nations have embassies in Copenhagen, and most other countries have embassies in either Stockholm or Copenhagen responsible for consular services to the whole Scandinavian region. EU member nations often maintain consulates in the provinces. At present, there are 71 foreign embassies in Copenhagen and more than 100 consulates in Copenhagen and larger cities, such as Aarhus, Aalborg, Odense, Vejle. If you fall victim to serious criminal injuries while in Denmark, you might be eligible to financial compensation. If you wish to file a claim you must report the incident to police within 24 hours, and file a form obtainable from the police to Erstatningsnævnet; Gyldenløvesgade 11, 1600 Copenhagen V. Tel +45 33 92 33 34, Fax: +45 39 20 45 05, Email: erstatningsnaevnet@erstatningsnaevnet.dk. Claim processing time is a minimum of 3 months. By most standards, the Danes have a great deal to learn about customer service, and many visitors may initially be appalled by the low standards present outside upmarket establishments, used to dealing with international expectations. Cleaning tables and removing trash from messy customers has a low priority and it is not uncommon to experience staff doing other duties than serving, while happily keeping customers waiting. Also do not expect any sirs or madams; verbal bromides seem awkward to most Danes, including those behind a counter. On a practical level, the service situation means that you should only expect table service in restaurants. In most cafés and bars you usually order at the desk and pay immediately when ordering, even if you intend for a second order. Luckily, Danes have a civilised queue culture generally and waiting for your turn at the desk without loosing your temper or trying to cheat on other customers is standard practise, and you are expected to behave likewise. As with most cultural issues, there are several reasons for this situation. Some attribute it to the egalitarian Danish culture along the line: "you are not worth any more than me, so why should I treat you any different", while a major reason might be ascribed to the fact that most service personnel in Denmark are untrained people, often underaged or part time students, working for a low salary, so they have no clue how to service customers beyond the rudimentary. Another aspect stems from Danish culture in general, which seems to cherish and promote direct interpersonal contact and request and a low-key service attention. Allowing other people space to move and breathe is considered part of proper hospitality and politeness. Danes themselves seems to have coped with the service situation and do not expect much outside high-end places. By and large, it is just one of those issues you will have to deal with while visiting, and throwing a hissy fit or demanding to speak to the supervisor is unlikely to get you anywhere. On the upside, tipping is neither expected nor required, and that goes for professional and trained attendants as well. When you do bump into good service, it tends to be truly genuine helpfulness, rather than an expectation for tips or employee training courses - so savour such moments, tip if you feel for it, and forget about the rest. Apart from children's shows, nothing gets dubbed in Denmark - although a sizeable portion of broadcasts in Denmark are American and British productions - so even with no English channels, there will usually be something on in a comprehensible language. The same goes for cinemas - so you should be safe for a lazy rainy day. Nearly all hotels will have CNN and BBC World available. If you want to be updated with local news, the Copenhagen Post is Denmark's sole English language newspaper. It is published weekly and available in many bars and Cafés in Copenhagen, while much harder to find in the rest of the country. For historical reasons, Denmark is a central hub for access to the truly fascinating North Atlantic region, with direct flights to several cities on Iceland, Faroe Islands and Greenland. The region is especially renowned for its unique natural landscapes as well as strong national and cultural heritages, still being kept alive and protected. Hanstholm in Northwestern Jutland has weekly ferry services to Torshavn on the Faroe Islands and Seyðisfjörður on Iceland. Longyearbyen on Svalbard can be reached from several cities, once or twice weekly with a single stopover in Oslo. Similar in culture and sharing large parts of history, Sweden is nearby not only by geography. The Southern part in particular can easily be reached from Copenhagen via the bridged Öresund and is a great place to experience similar historic and natural attractions around Malmö and Lund. The Scanian lands of Southern Sweden was part of Denmark until 1658 at the end of The Great Northern War and presents many outstanding examples of Danish Renaissance architecture from large manors to romantic townscapes. These parts are often, by the rest of Sweden, still regarded as closely linked with Denmark because of a particular dialect of Swedish spoken here that is somewhat related to the Danish way of pronunciation. The southern parts are especially famous for Viking sights and a romantic countryside setting. Going further North in this huge country, Sweden is a place for enjoying nature and can be reached from several places. From Copenhagen there are direct flights to the capital of Stockholm and Western Sweden can be reached from Jutland by ferry through the Frederikshavn-Gothenburg or Grenaa-Varberg links. Germany is the only country Denmark has a land border with, and for faster access from the east of the country there are frequent ferry connections to Denmark's southern neighbor. Germany's two largest cities, Berlin and Hamburg are only a few hours by car or train from most of Denmark as are the German islands in the North and Baltic Seas, Lübeck and other Hanseatic cities and a whole slew of historical sites from different epochs. This country travel guide to Denmark is an outline and may need more content. It has a template, but there is not enough information present. If there are Cities and Other destinations listed, they may not all be at usable status or there may not be a valid regional structure and a "Get in" section describing all of the typical ways to get here. Please plunge forward and help it grow! This travel guide page was last edited at 19:02, on 30 March 2019 by Wikivoyage user RhinoMind. Based on work by Wikivoyage users Philaweb, Neils51, Matroc, LPfi, Yvwv, Ypsilon, Traveler100bot, Sween64 and Ikan Kekek and others.